Investors in Nevada’s medical marijuana industry are waiting to see if voters choose to legalize recreational use for adults 21 and older. If a majority of Nevada voters check “Yes” on Question No. 2 on the 2016 ballot, some investors are expecting the industry to grow by as much as four times. “I definitely think that you’ll see a very large spike in construction in regards to more grow facilities if Question 2 is passed,” said Nathan Schweigart, president of Las Vegas-based NDL Group Inc., a general contracting and consulting firm. That’s because the more than 110 licensed investors behind the valley’s grow facilities and dispensaries have plans to raise larger, more expansive cultivation operations if the ballot measure passes. 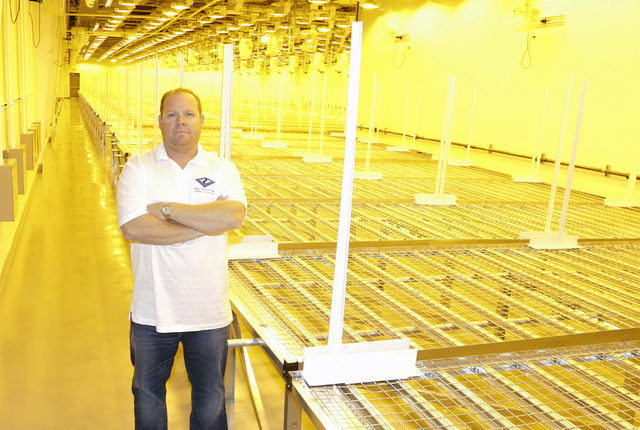 NDL Group is finishing a cultivation facility in North Las Vegas for GreenMart of Nevada LLC. GreenMart plans on using one-third of its 30,000 square feet of space across two buildings. If legalization passes, the remainder of the space will be utilized for growing more product for the larger pool of customers. If the measure fails, growth into the rest of the available space will happen at a slower pace, Schweigart said. 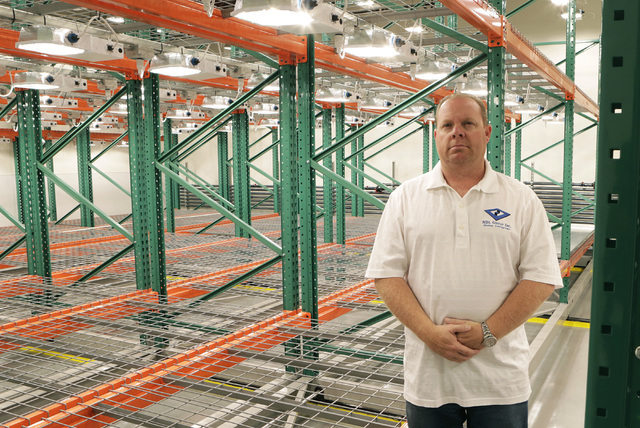 The GreenMart cultivation facility also has more room to grow, with 2½ acres of vacant land behind the warehouses. This land could house an additional 60,000 square feet of grow space if things go right, Schweigart said. Several other facilities around the valley are in a similar situation — using part of their available space for now, Schweigart said. Derek Peterson, CEO of Terra Tech, which owns medical marijuana operations in Nevada including Blum — a medical marijuana dispensary — said his operation is expanding. And he, too, has multiple plans, depending on the results of the Nov. 8 decision. Peterson said Terra Tech is looking to expand its operations if the measure is approved. The company has purchased some of the space it was previously leasing, and it also has plans to develop a plot of land. “We’re in kind of construction mode right now, but if we wake up Nov. 9 and adult-use passed we’re going to expand that footprint and purchase the adjacent lot,” Peterson said. The industry is unlikely to grow right away. If the measure passes, the state will have until Jan. 1, 2018 to start accepting license applications for recreational marijuana dispensaries, cultivation, marijuana testing, manufacturing and distribution facilities. Also, for the first 18 months after the application period opens, the Nevada Department of Taxation, which regulates the industry, will only allow medical marijuana operators to apply for the recreational-use license, according to a summary of upcoming ballot measures by the Nevada Secretary of State’s office. The passage of Question 2 would allow for as many as 80 recreational marijuana dispensaries in Clark County. Application fees will run from $5,000 for a dispensary to $30,000 for a cultivation facility. If not enough license-holders on the medical-use side apply for a recreational license, others will be allowed to apply. Peterson sees things playing out in a similar fashion to when medical marijuana legislation was passed in 2013. Legalizing recreational marijuana will mean the potential for more dispensaries, cultivation facilities and growth in other things like that, which is going to bring another race for real estate — mostly in the industrial sector, he said. The situation in Nevada’s commercial real estate will be similar to that of Colorado, Peterson said. Most in the medical marijuana industry agree that financing can be challenging. Riffel said financing is difficult, if not impossible, to obtain. The marijuana industry is typically an all-cash business and banks are trying to avoid violating federal anti-money laundering laws. Mike Shohet, 2016 president of NAIOP Southern Nevada, said banks that lend money on a property won’t extend loan payments for owners who lease space to marijuana-related operations. “You really need to own the building free and clear,” Shohet said. The rush on commercial real estate could be less than it was when medical marijuana licenses went up for grabs in 2014. In August of that year, 519 applications were submitted to the Nevada Division of Public and Behavioral Health for approval to open a medical marijuana dispensary, cultivation or production facility or testing laboratory. To apply, applicants had to have signed permission from the landlord of a building they were leasing or own a building to house operations. Tassi said there were groups buying buildings on spec, with the assumption they were going to get a license. On the leasing side, groups would put down large deposits on industrial buildings. If applicants didn’t get approved, their deposit was at risk, Tassi said. In total, the Nevada Division of Public and Behavioral Health approved 372 provisional licenses for Northern and Southern Nevada in 2014. Operators also had to gain approval from Clark County to open for business. To date, more than 110 medical marijuana cultivation, dispensary, production and laboratory facilities have received approval from the state and Clark County to operate. That demand slightly increased the cost of commercial buildings in the valley. “If the cultivation operators were tenants, the landlords were able to maximize the lease rate, so they went above market for that,” Riffel said. He said it was the same situation with medical marijuana operators looking to purchase a building, as sellers were able to obtain higher pricing because of demand at that time. Peterson said when he was looking to lease a building for his operations, owners were demanding a premium. A building that would normally cost around 75 cents per square foot ended up bringing in about $1.10 per square foot, he said. Some of the pricing was not just the result of higher demand. Riffel said marijuana cultivation facilities have a specialized needs, so that if a grow facility moved, the owner would have to retrofit the structure to meet the needs of a standard industrial user. Tassi said some of these upgrades in power infrastructure needed to convert an industrial building for medical marijuana grow operations can run in the hundreds of thousands of dollars. Several arguments persist in the debate over legalizing recreational marijuana use in Nevada, such as the potential to reduce activity by drug cartels and other criminal operations in the state, according to a summary of Nevada’s 2016 ballot initiatives by the Nevada Secretary of State. Under the passage of Question No. 2, persons 21 and older would be able to purchase and consume up to a certain amount of marijuana. It would also make it legal for these individuals to cultivate as many as six marijuana plants for personal use and obtain marijuana paraphernalia. Four other states have an option to legalize recreational marijuana on their ballots this year: Arizona, California, Maine and Massachusetts. Arguments from the Coalition to Regulate Marijuana Like Alcohol, a group in favor of the measure include product safety and putting measures in place to keep marijuana out of the hands of minors, by requiring retail stores to check identification. Nevadans for Responsible Drug Policy, which opposes the passage of recreational marijuana, argues the black market will likely not disappear in Nevada, nor would cartels disappear with recreational marijuana becoming legal. Other arguments against the measure include the lack of opt-out clauses and the taxes collected would not be much of a boon for public schools. Representatives for the two groups came together during a round table discussion on Vegas PBS Channel 10 on Sept. 30. The lineup included Clark County Commissioner Chris Giunchigliani and Joe Brezny, a spokesman for Regulate Marijuana Like Alcohol — both for the initiative — and Pat Hickey, co-chair of Nevadans for Responsible Drug Policy, and Metropolitan Police Department Lt. Todd Raybuck — both against. In September a PAC called Protecting Nevada’s Children started buying and running ads to fight the measure. The biggest financial backer of Protecting Nevada’s Children is Las Vegas Sands CEO Sheldon Adelson. Other donors include South Point Casino, MGM Resorts and Boyd Gaming. Hickey blamed what he called a poorly drafted initiative for allowing advertising directed at children and the possibility of edible products being too appealing to children because of their colorful designs. Brezny’s response was that marijuana products would stay out of the hands of children because buyers of recreational marijuana products would have to show identification. In addition, a bill proposed for the 2017 legislative session would ensure edible products be sold in plain packing, which would lessen their attractiveness to children. Nevada children could benefit from the passage of the measure. A July report by RCG Economics and Marijuana Policy Group showed a 15 percent excise tax on recreational marijuana would raise $20 million annually. Part of these funds, minus costs of carrying out the provisions of the measure by the Nevada Department of Taxation and local governments, would go to Nevada schools. On top of the excise tax, part of the revenue from licensing fees and penalties collected by the Nevada Department of Taxation related to the regulation of the recreational marijuana industry would also go to Nevada schools. Estimates in the RCG report on licensing fees were $7 million. Leslie Bocskor, managing partner of Electrum Partners, an advisory services firm that specializes in medical and recreational marijuana industry, said the economic impact would be large for Nevada, creating ancillary markets. A lot of this would be due to the tourism market. RCG estimates more than 6.8 million nonresidents would purchase at one of Nevada’s recreational dispensaries each year, compared to just over 321,000 Nevada residents. So far, the infrastructure cost of building new facilities for medical marijuana has brought in about $400 million, Bocskor said. According to the report by RCG Economics, income generated in the first seven years after legalization would be $1.7 billion. And 6,200 jobs would be created by 2024.